Our pool is all lit up in the evening! Whirlpool, pool for adults and waterslide! Dining room overlooking the pool ..
Hotel Caravel is a 3-star hotel in Misano Adriatico, run by the Arcangeli family for thirty years. Ideal for families, has a garden, games for children and free private parking. A swimming pool with hydromassage and waterslide is available at the nearby "Adriapark". Small pets allowed. 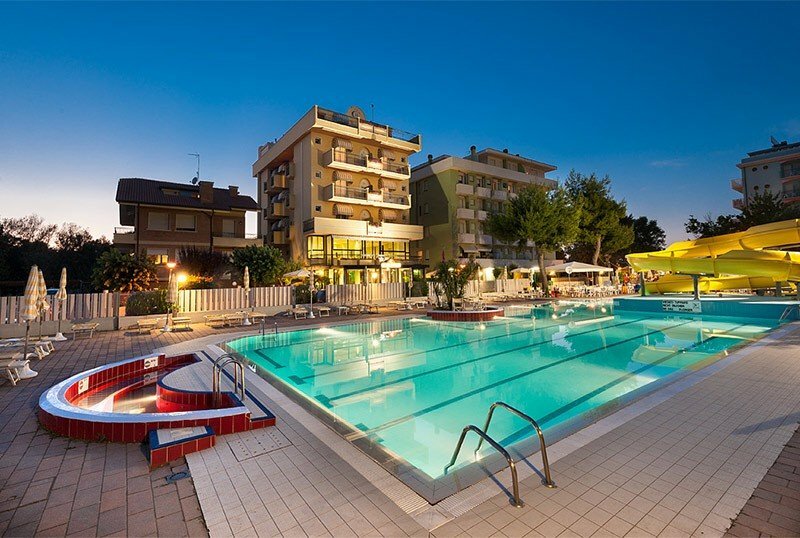 The property is located in Misano Adriatico, a 2-minute walk from the beach and a few steps from the Mare Nord Park. The rooms have a balcony, sea view, air conditioning, WI-FI, mini fridge, private bathroom with shower and complimentary toiletries, hairdryer, telephone, safe, satellite TV. FAMILY : available connecting rooms and solutions suitable for families. Swimming pool with hydromassage, solarium and waterslide available, garden, free use of bicycles, bar, living room, elevator, satellite TV room, newspapers available. PARKING : covered and private for free use. WI-FI : available for free throughout the entire hotel. BREAKFAST : buffet with sweet and savory dishes. LUNCH AND DINNER : choice between two menus based on meat and fish, inspired by the Romagna tradition with homemade pasta. Buffet of vegetables and appetizers. In hotel : outdoor playground area, pediatrician on request, baby / mini club by the pool, entertainment. Children's pool a few meters from the structure. In the room : cots, cribs. At meals : high chairs. Swimming pools available at the Adriapark water park, located in front of the hotel, reachable in a few steps. There is a colored tub with shallow water for the little ones, a 280 square meter pool for adults with a waterslide. Present beach tennis courts, beach volleyball and bocce, hydromassage, green area with games for children, bar and solarium equipped with beach umbrella and sunbeds, entertainment, baby club and mini club. Hotel Caravel has an agreement with the beach no. 24 (pet friendly) and n. 26. The gratuity refers to the first child if in a room with 2 adults and for stays not shorter than 3 days. To know more promotions for children valid at other times please contact us! 1° Child to 8 years --- FREE ! Children can have reduction prix 2019 eventhought they stay with 1 adult. € 380,00 per week per person in double room. - 1 sun umbrella per room and 1 sunbed per person at the beach. € 380,00 PER PERSON PER WEEK! 7 days per person in double room with full board, water and wine at meals, 1 umbrella per room and 1 sun bed per person on the beach.